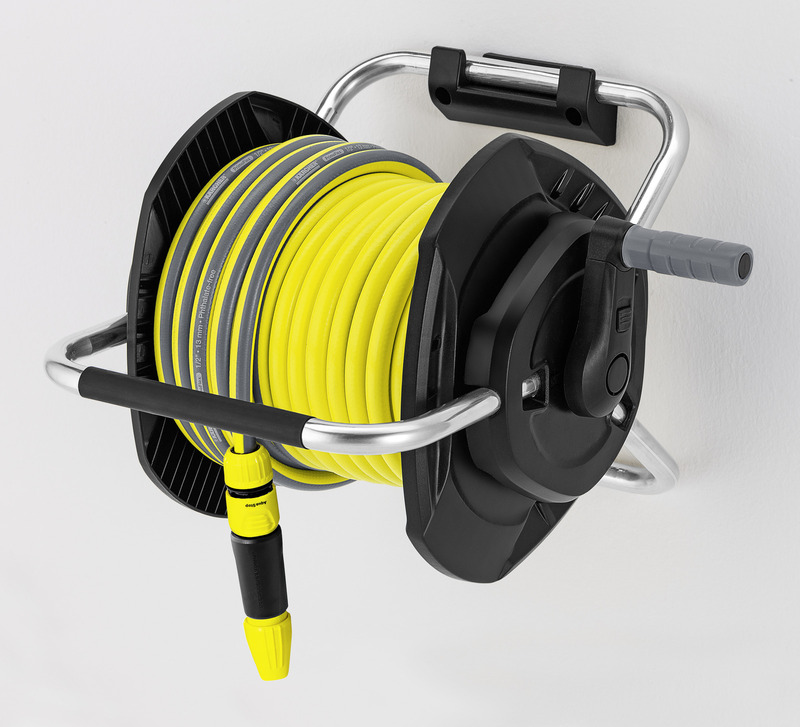 25m Free Standing/Wall Mounted Hose Reel 26452810 https://www.kaercher.com/ie/home-garden/watering-systems/hose-storage-and-hose-trolley/25m-free-standing-wall-mounted-hose-reel-26452810.html The Kärcher 25m hose reel can be both wall mounted or left free-standing. 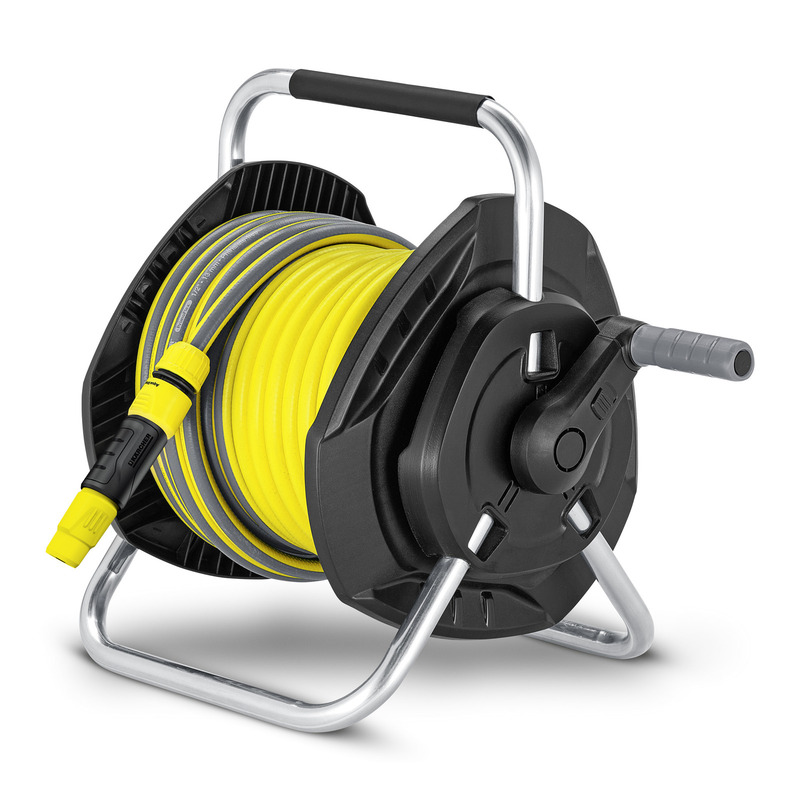 Included 25m PrimoFlex® hose (1/2"), sprayer, adaptor kit for mobile and stationary use, and extra smooth hose reel. 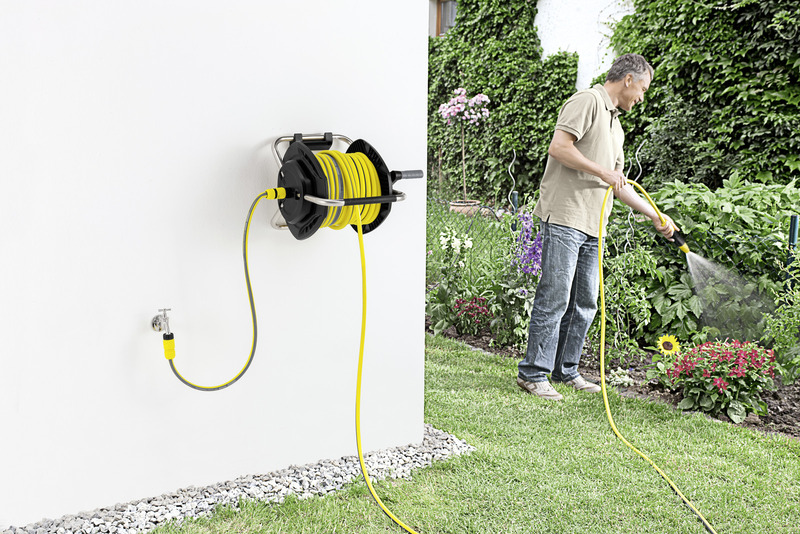 The Kärcher 25m hose reel can be both wall mounted or left free-standing. 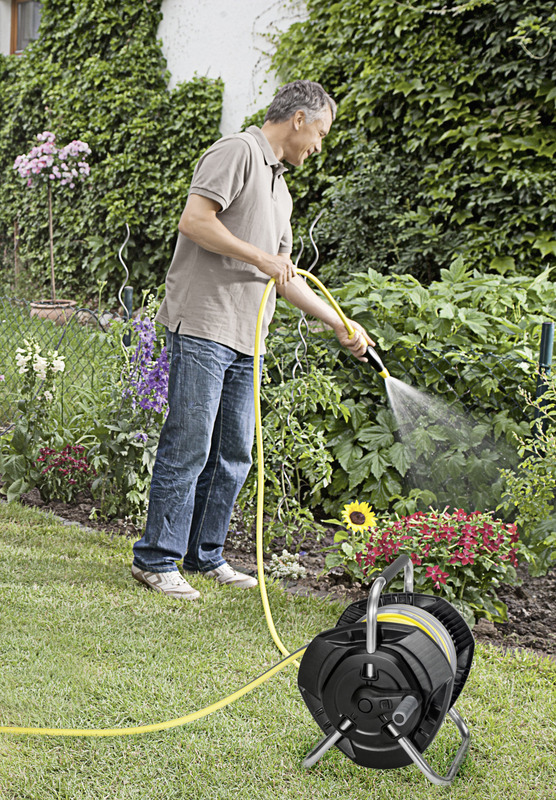 Included 25m PrimoFlex® hose (1/2"), sprayer, adaptor kit for mobile and stationary use, and extra smooth hose reel. 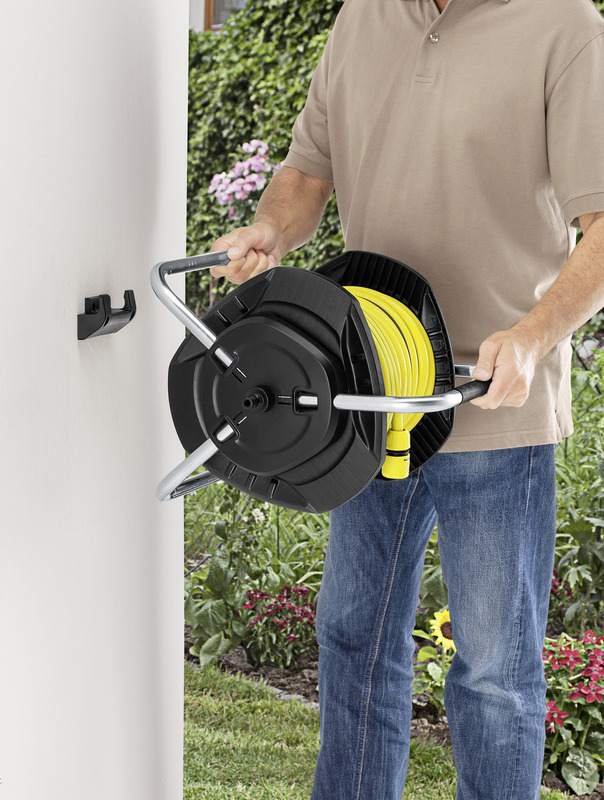 The Kärcher 25m hose reel kit comes ready to connect, with a robust frame and includes a 25 m quality PrimoFlex® 1/2" hose. The hose can be used for both mobile and stationary watering thanks to the practical hose storage feature. It is particularly suitable for small to medium-sized gardens. The hose reel is deisgned to stand safely and securely even on uneven ground, thereby ensuring a consistently high level of comfort for you. The hose is smoothly wound and unwound, making setting up and packing away easy. This kit comes with: 25 m 1/2" hose, sprayer "Plus", 4 universal hose connectors (3 without and 1 with aqua stop) and 1 G 3/4 tap adaptor with G 3/4 to G 1/2 reducer. Kärcher hose reels are compatible with all of available connection systems. 25 m 1/2" hose, nozzle, 4 universal hose connectors, G 3/4 tap adapter with reducer G 3/4 to G 1/2. Simple and quick installation of the practical storage unit. Good stability (also on uneven terrain). Optimised distance between hose and stand legs for convenient handling and simple reeling. 25m Free Standing/Wall Mounted Hose Reel is rated 3.5 out of 5 by 17. Rated 2 out of 5 by Jacqui from Not fit for purpose Had Karcher barely 4 months. Keeps falling off the wall. There's a design fault & the steel leg connections have come away. Being elderly i can't stoop down to use it on the ground, which is why i spent nearly £50 on a wall mounted. I've contacted Karcher via email 5 times & getting nowhere. Tried phoning there's a continuous queue. Need to be using it now. Still under warranty but can't find receipt. The Karcher is now redundant..I cannot buy another hose, this one is virtually new. Very angry.Looks like everyone is complaining about the same fault. Rated 5 out of 5 by The Ace from Great Accessory. I’ve had it 2 weeks now & so pleased with it. In fact I’m going to use it right now! Rated 1 out of 5 by Stevewright from Great hose, terrible reel I have a number of kaercher products and thought that the brand stood for quality- how wrong i was.the hose itself is great, however i wanted to tidy the garden area and as the reel came with a wall mounted bracket i finally got round to mounting it to the wall. It lasted a few hrs before it came crashing down( the bracket is still on the wall, thee metal tubing from the reel itself disconnected). There was no tugging or pulling of the hose, in fact i was in the house and came out to find it in a heap on thr ground. From reading other reviews here and elsewhere it seems to be a common problem- ie how the tube is held together is useless and not fit for purpose! Rated 2 out of 5 by Kitchengardener from Good up to a point I have had the hose for a month now and it worked well up to the point that I mounted it on the wall bracket. The legs are not attached to the reel in a sufficiently robust manner to stop the two parting company when hanging from the wall. Clearly the product was not tested sufficiently to recognise this problem and, from the number of reviews giving the same issue, it is a product wide issue and not an isolated case. Rated 2 out of 5 by gavtor from Only 1 problem I have had hose for a month now and all was excellent until I mounted it to wall and hose reel is too heavy for the clips that hold the legs ,So I can't use wall mount . The quality of the hose and reel free standing is perfect for all main uses . Rated 1 out of 5 by Tony300 from No use - if you want to hang it on the wall. Very happy for a day, and then it fell off the wall! The tubing you use to slot into the wall bracket (i.e. one of the legs if its floor standing) is only held in place on the drum by a hole in the top of the tubing. As the leg pushes into the drum there is only a small wedge shaped piece of plastic on the side of the drum that indents into the hole on the leg. It is not fit for purpose. In hot weather as the plastic softens it cannot hold the weight of the hose and all the water in it! and the plastic lugs slide out of the holes and the drum comes away from the tubing. Very disappointed as other than this it would be great. It needs stronger (i.e. a nut/bolt) to secure the tubing/legs to the drum so that when you suspend it off the bracket by these, they are properly secure! Rated 2 out of 5 by Sav1 from Karcher is a quality manufacturer which is why I bought this hose and reel. The hose feels to be a quality product soft enough to roll up nicely when you finish with it. the reel however is not so good. The metal tubes push into holes and lock in place. It sat on my wall for a week and the tubes came out, I had to use screws to ensure they did not fall out again. Problem solved, but should you have to do it, No I don't think so. So to sum up. The hose is great, the reel is not. I called the customer service line to ask of this was a know problem and they said no, however looking on various retail review sites (Amazon and Argos) other people have had a similar issue, it's a shame!